Popcorn Time is a streaming platform that can transform your home entertainment. It is an open-source BitTorrent client with an integrated media player, and it allows you to play movies, series, documentaries and other videos on torrent sites. Popcorn Time lets you watch all these kinds of videos free of charge and in HD. You will even find the latest blockbuster titles on the front page. Thankfully, Popcorn Time is super compatible, and it can be installed on all major platforms. These include Windows PC, Mac OS, Linux, iOS, and Android. 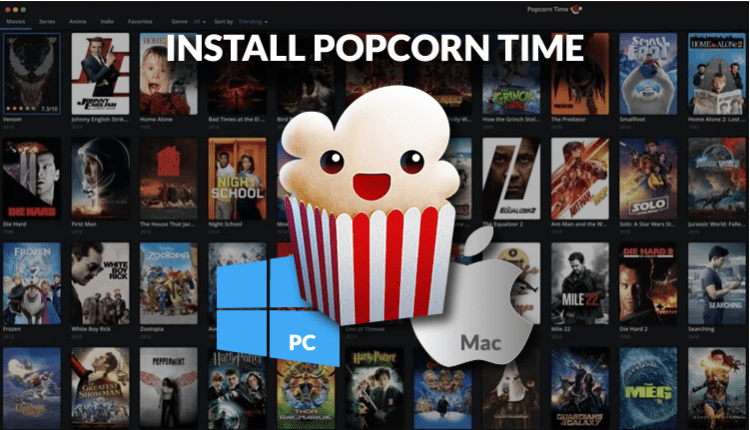 In this guide, we are going to show you How to Install Popcorn Time on PC or Mac. You can also check out our guide on how to install Popcorn Time on Android TV Box. If you thought that nothing would sound so good without a catch, you are absolutely right. You can get any movie or TV show you want with Popcorn Time free and in HD, but the content isn’t legal. The links provided by Popcorn Time are usually pirated and hence the reason they are free. Watching such content can therefore quickly land you in trouble with the authorities. You can receive a DMCA notice and even end up facing some serious legal issues. Your ISP can also decide to throttle your internet connections for streaming illegal content. This is especially considering that P2P traffic is frowned upon by ISPs and copyright agencies since it promotes piracy. To be on the safe side, you need to always use a VPN. The software itself advises you not to stream without one, as it may end up causing more harm than good. The best VPN for torrenting is IPVanish. Apart from having specialized VPN servers with unlimited bandwidth, IPVanish doesn’t keep any of your internet logs. They also use solid encryption standards such that nobody can make sense of what you are doing online or intercept your traffic. The VPN is also super fast, and you will always have a 30-day money-back guarantee period with any plan. Here’s an exclusive deal to help you get started. The procedure for installing PT on a Windows computer or a Mac device is quite straightforward. There are however numerous versions of Popcorn Time due to the software being open-source. You never know if some developers have added malware to their product, and so we suggests using https://popcorntime.sh, which is the official website. Start by launching your browser on your PC or Mac. Preferably, use Chrome on Windows PC, or Safari if you are using Mac. Type the URL “popcorntime.sh” on the address tab. Your browser should now open the official website. Once you get to the official site, the website will automatically identify the device that you are using. All other apps will be withdrawn, and the website will present you with the one for your device. You can just click the “Download” button presented. The installation file should now start downloading to your computer. Just install it like any other app. However, don’t launch it yet. The reason why you shouldn’t run the app yet is that you need to install your VPN and connect to a server first. Subscribing and installing IPVanish, won’t take much of your time – it only takes 5 or so minutes. You can subscribe by taking advantage of the 57% that we are offering to our Bestdroidplayer readers. IPVanish allows you to connect to many devices simultaneously, and so you can also install the VPN as well as Popcorn Time on your Firestick, Smartphone or Android TV. Popcorn Time will definitely take your home entertainment up a notch. The platform will even offer you a bigger library than Netflix, but you should never use the app without a reliable VPN like IPVanish. Always launch it before PT, and you will then be able to stream without worrying about copyright trolls and ISP throttling. If you liked this article on How to Install Popcorn Time on PC or Mac, please share it with your friends, and/or leave a comment.